The season of classics ends with French Cancan (NC16, 105 minutes), a 1954 landmark work by director and co-writer Jean Renoir. The musicial, starring Jean Gabin, celebrates the famous dance by telling the story of its creation in the 1890s. The late American film critic Roger Ebert called it "a delicious musical comedy that deserves comparison with the golden age of Hollywood musicals". Anya Taylor-Joy and Harvey Scrimshaw (both above) in The Witch. Patriarch William (Ralph Ineson) is cast out of his village for accusing the elders of slacking in their Puritan faith. With wife Katherine (Kate Dickie) and four children in tow, he ploughs virgin soil on the frontier. But 17th-century America is a place of shadows for the immigrant family, who come to regret leaving the sunlit fields of England. It is clear that writer-director Robert Eggers is a history buff in love with the minutiae of life in the new American colony. Film or stage portrayals of the Salem witch trials are meant to be understood as metaphors for modern forms of persecution. Eggers chooses the literal route - his witches are real, ghastly creatures in league with the devil and the children's stories about them are all true. The Witch is screening exclusively at The Projector. Siblings Annie (Nicole Kidman) and Baxter (Jason Bateman) return to their childhood home in search of clues when their famous performance artist parents, Caleb (Christopher Walken) and Camille Fang (Maryann Plunkett), suddenly disappear. As an actor, Bateman has carved out a career playing Mr Nice Guy, you know - the guy who is everybody's friend. As a director, he is showing his propensity for much darker fare. This is a peculiar story and Bateman is adept at keeping the tone of the film consistently dark throughout. Despite an ending that is not completely satisfying, he has painted a portrait of a very believable family, idiosyncrasies and all. Shane Black, Hollywood's king of bickering-buddy pictures, returns to the Los Angeles noir territory he covered in Kiss Kiss Bang Bang (2005). It is the 1970s and Holland March (Ryan Gosling, above right) is a private detective. Jackson Healy (Russell Crowe) is a bully who roughs up other bullies for a living. The men are at first enemies, but later have to work together to look into the disappearance of an actress, Amelia (Margaret Qualley). The things that fans like about Kiss Kiss are here: This is a two-hander in which men express affection by taking digs at each other. Their schemes always work, but never in the way they intend and every scene pays off with a joke, either verbal or visual. 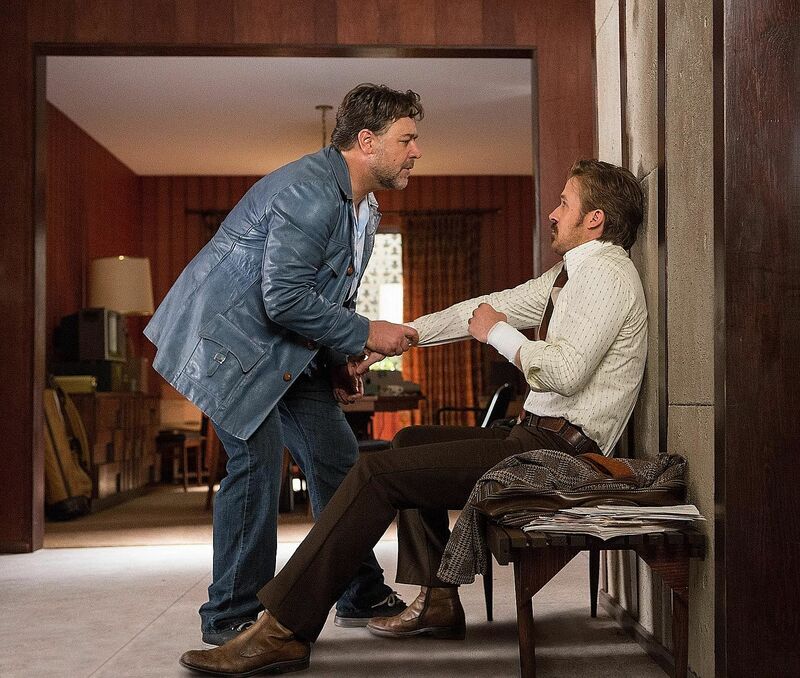 Gosling and Crowe give charming, lighter-than-air performances.